Manage your tax efficiently by using a tax software that will help you to shorten the process of tax preparation and filing, and accessible wherever you are. All features of eBIRForms plus more! 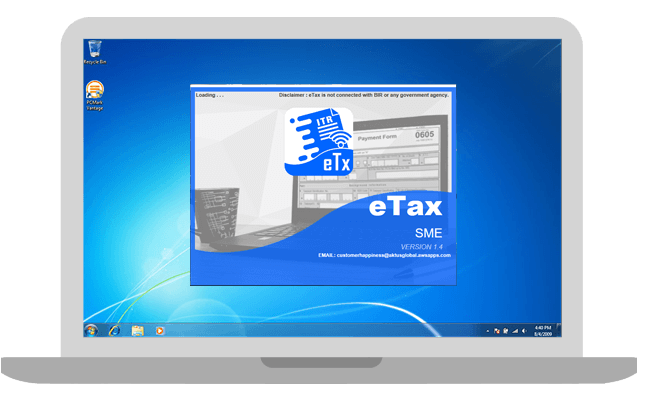 Etax.ph is a web-based tax software that can be used by taxpayers and tax preparers to file taxes conveniently and easily. It contains frequently used BIR forms you need to comply. Etax.ph contains updated BIR forms which are compliant with TRAIN LAW. Its web – based feature allows the users to file taxes anywhere they are. eTax allows you to accomplish all your tax returns comfortably at your most convenient place and time. More features to be available soon. Filing of tax returns to BIR is just a click away at eTax. Review and submit your tax returns efficiently and conveniently. You can create multiple companies or taxpayer in eTax and save, file and view the tax data from different taxpayers anytime while making said data secured. You no longer have to worry on the accuracy and consistency of your account balances as eTax will automatically carry-over to the next period the ending balances of the accounts in your previous tax return(s). User no longer have to refer or copy data. Since eTax auto fill up the annual reports using the data saved on the monthly tax forms. Being an online tax platform, you can now easily access, make a copy and print your prepared BIR forms wherever you are using internet connection. Errors will be avoided as you can take your time reviewing the information you entered and the system validates the information for you. Miscalculations won’t be a problem as it is the system that calculates for you. Provide your email address and phone number(optional) to create your account with us. You will receive a confirmation link and be redirected from there. Fill up required personal information such as full name, contact number, username, and password. Tangkilikin ang sariling atin! eTax.ph is very user-friendly. You have access to BIR Updates and most especially you have access to tax consultants by just going to Chat Support. You will also never forget the deadlines or missed the filing or payments because you can easily monitor and track from the Tax Calendar. Above all, you no longer need to route on your files to look for your previously BIR forms. All of these benefits in just a very minimal fee. So economical. 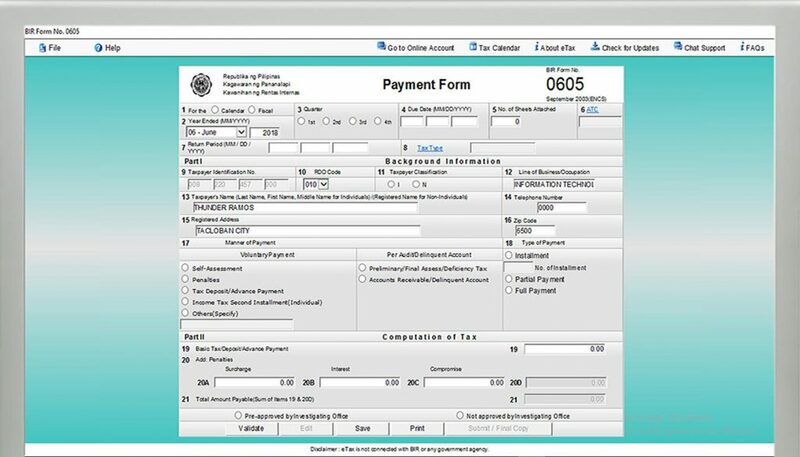 Tax software is defined as a type of computer software designed to help individuals or companies prepare and file tax returns for income tax, VAT or Percentage tax, withholding taxes and other required tax returns. Tax software streamlines the process of filing taxes by walking the user through tax forms and calculates automatically the individual’s or company’s tax obligations.